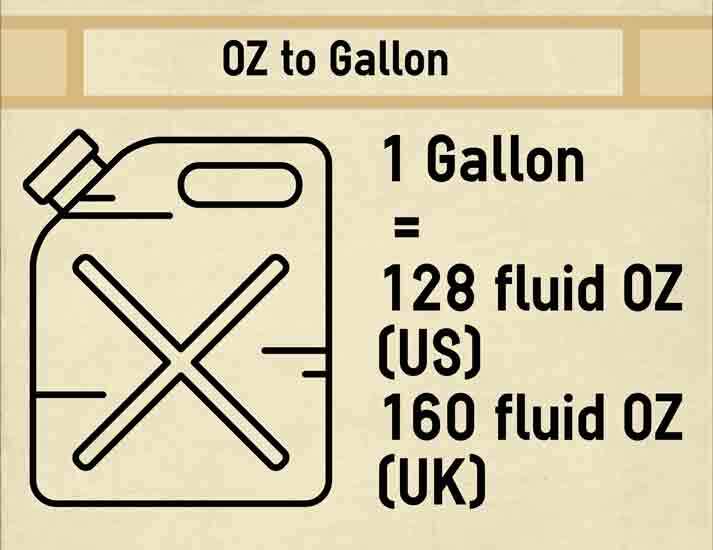 You can use oz to gallon calculator below or do the calculation by your self with the conversion factor . 1 Ounce [Liquid OZ, US Customary Units] = 0.0078125 (1/128) Gallon [liquid, US Customary Units]. 1 Ounce [Liquid OZ, UK British Imperial System] = 0.00625 (1/160) Gallon [liquid, UK British Imperial System]. A fluid Ounce (OZ) is unit of volume also called capacity is almost equal to 28.4130625 millilitres (28ml) in the British imperial system. Therefore a fluid ounce (OZ) is consequently equal to 29.5735295625 milliliters (30ml) in the US Customary Units. Note: Most of all the US regulation defines the liquid ounce as exactly 30 milliliters as per 21 CFR 101.9 but this is for the labeling only. Task 1: Convert 64 US fluid ounces to US gallons. 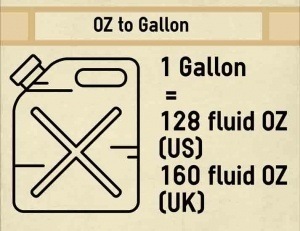 fl OZ / 128= gallon. 64 fl OZ / 128= 0.5 gallon. 64 US fl oz is equivalent to 0.5 gallon. Task 2: Convert 64 British imperial system. 64 fl OZ / 160= 0.4 gallon. 64 US fl oz is equivalent to 0.4 gallon. 128 OZ. 1 gallon. 160 OZ. 1 gallon. 64 OZ. 1/2 gallon. 80 OZ. 1/2 gallon. 32 OZ. 1/4 gallon. 40 OZ. 1/4 gallon. 16 OZ. 1/8 gallon. 20 OZ. 1/8 gallon. 8 OZ. 1/16 gallon. 10 OZ. 1/16 gallon. How to Read P&ID Piping and Instrumentation Diagram for non-process engineer?